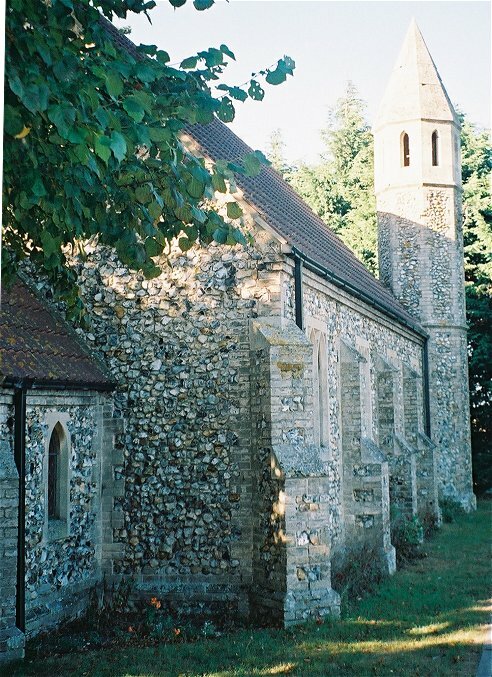 Mildenhall parish, the largest in Suffolk, has long been an outpost of non-conformity. Of the five main settlements, Kenny Hill is the furthest from the town itself, so it is not surprising that residents found it easier to go to the Methodists and Baptists of Beck Row and West Row rather than travel all the way into Mildenhall to St Mary. The Victorians saw that this was a Bad Thing, and with the short-sighted enthusiasm of the mid-century set about overstretching the CofE with three mission churches in remoter parts of the parish. One of them was placed here at Kenny Hill - not, in fact, St James, which came a little later. The original mission church was one of those delightful iron churches, which was erected in 1876. Kenny Hill is right out in the fens, as far out on the edge of Suffolk as is possible without being in Cambridgeshire or Norfolk (the three counties meet about a mile to the north). Anyone who knows this area will also know how windy it can be out here. 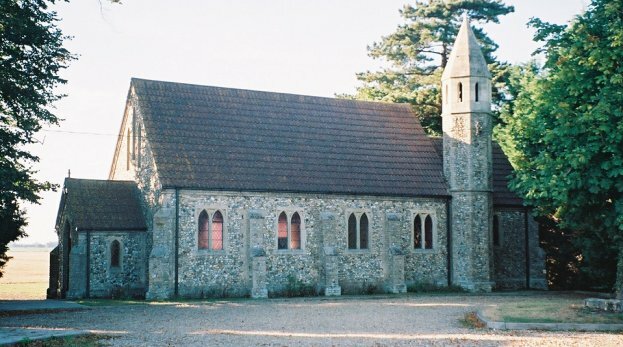 Remarkably, the tin church lasted 19 years before it was blown down. St James replaced it. Anne Riches, in the supplement to the 1975 edition of Cautley, tells us that the architect was Matthew Morley, and it went up in 1895. The style is an undemanding Early English, although the minaret owes more to Moorish architecture than anything the Plantagenets ever put up. I think it would make a good mosque. As the CofE went into managed retreat in the 1970s, St James was declared redundant, being snapped up fairly quickly by a group of American evangelicals. The same thing happened a few miles off at Wangford. Whyso? Simply, half a century after it was built, St James found itself on the edge of one of the busiest American airbases in Europe. 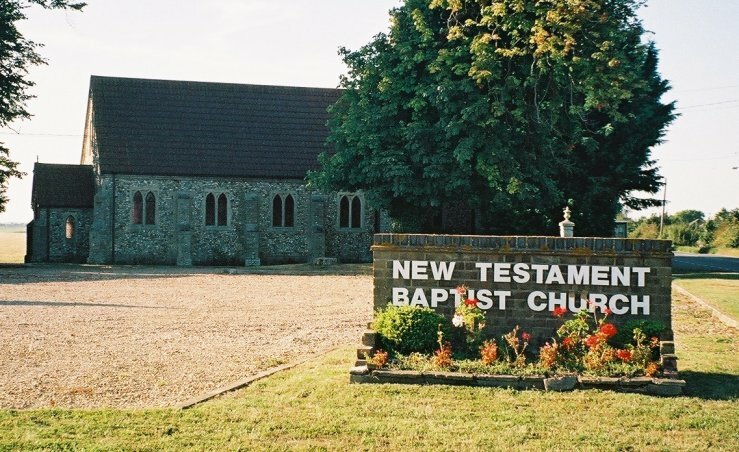 The new owners, the New Testament Baptist Church, have built a suite of buildings to the west of the old church, one of which is a large hall; the former St James is used as a teaching area for children who attend the church. Although base personnel make up a large proportion of the congregation, they welcome increasing numbers of local people as well. Preserved in the churchyard is a simple war memorial for the Suffolk Regiment. Also preserved is the east window given by 'the residents of Mildenhall' in 1900. It shows St James and the Blessed Virgin flanking a crucifixion. I called on a Saturday and was unable to see it from the inside, but I understand that the new building is staffed from 10am until 3pm each weekday, and that they would be glad to show you around.